Happy Halloween! I hope everyone has a happy, safe, and spooky night! 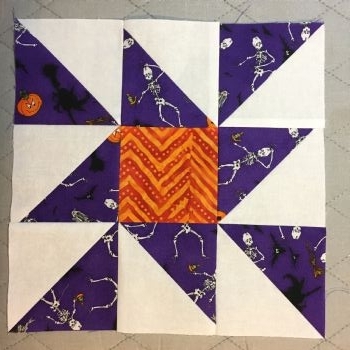 Today's block - Eccentric Star - is fun, but the last of this year's Halloween fabric. Well, I still have more, but won't be using anymore in this year's blocks. I kinda want to see how this block would look made into a full size quilt.